El Salvador: Central American gathering in solidarity with Cuba | Fight Back! San Salvador, El Salvador - On July 27-29, 300 delegates from organizations in solidarity with Cuba from the countries of El Salvador, Guatemala, Honduras, Nicaragua, Costa Rica, Panamá, México and Colombia participated in the Second Central American Gathering in Solidarity with Cuba. The gathering was organized by the Salvadoran Movement in Solidarity with Cuba, which is made up of various committees throughout El Salvador in solidarity with socialist Cuba. 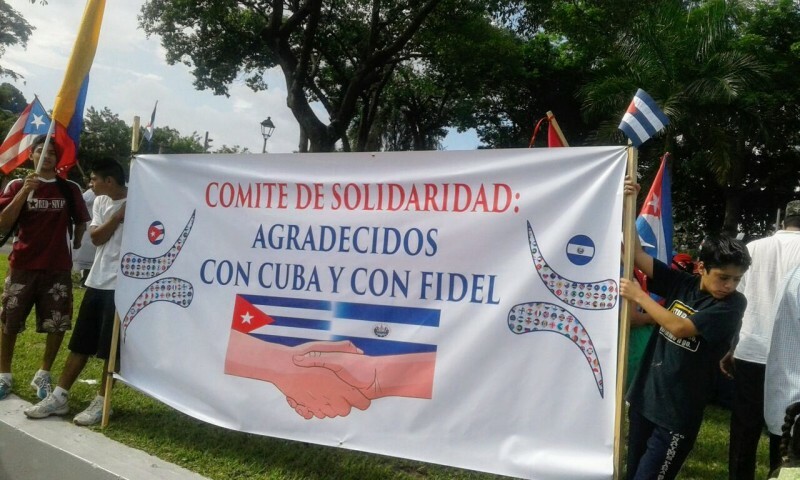 The gathering reaffirmed solidarity with the Cuban people and socialist government. Fernando Gonzalez came from Cuba for the gathering. Gonzalez was one of the heroic Cuban 5 who was imprisoned in the U.S. until 2014 and now is the president of the Cuban Institute of People’s Friendship (ICAP), which builds international solidarity. As part of the gathering, there was a march on July 27 in honor of Cuba’s national day of rebellion, commemorating the first armed uprising of the Cuban revolution. The march went from Bolívar Plaza to Martí Plaza. In the march there was a strong spirit of revolution and internationalism, with Cuban flags and revolutionary flags and banners. There was also a presentation on July 29 titled “International support for the Salvadoran people’s struggle against imperialist aggression, carried out by the oligarchy and their party.” That was followed by a discussion. Finally, there was tribute paid to Comandante Fidel Castro Ruz, Ernesto Che Guevara and Hugo Chavez. The final declaration of the gathering was read as well as the action plan that was adopted, and the event closed with a cultural performance.